(CNN) -- California Gov. Arnold Schwarzenegger has signed a bill commemorating Harvey Milk, the first openly gay politician elected to public office in the state, a spokesman for the governor said Monday. 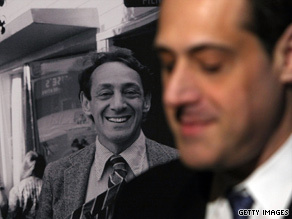 Stuart Milk, nephew of Harvey Milk, sits next to a photo of the gay rights activist in March. "He really saw this signing as a way to honor the gay community in California," spokesman Aaron McLear told CNN in a telephone interview. Schwarzenegger vetoed a similar bill last year, saying he believed Milk should be recognized at the local level. But since then, "Milk has become much more of a symbol of the gay community," McLear said, citing the eponymous movie starring Sean Penn, Milk's posthumous receipt of the Presidential Medal of Freedom and his induction into the California Hall of Fame. Milk served briefly as San Francisco's supervisor before he and Mayor George Moscone were assassinated in 1978 by Dan White, a city supervisor who had recently resigned but wanted his job back. Under the measure, the governor each year would proclaim May 22 -- Milk's birthday -- as a day of significance across the state. The bill was one of 704 signed Sunday -- most of them near the midnight deadline -- by Schwarzenegger, said spokesman Aaron McLear. The legislation passed the state Senate in May and the state Assembly last month. The legislation has been divisive, with the governor's office receiving more than 100,000 phone calls and e-mails, most of them in opposition, spokeswoman Andrea McCarthy said last month. But she added that most of the Twitter posts the governor received were in favor of the bill. Milk was a "unique" historical figure who led a civil rights movement and then was "assassinated in his public office for being who he was," State Sen. Mark Leno, a Democrat, told CNN last month. Gay rights activists march in D.C. The day of significance would not close schools or state offices, according to its text. However, Randy Thomasson, the president of SaveCalifornia.com, said the bill was vague and could allow for a number of things at schools, including gay pride parades or "mock gay weddings." "Harvey Milk was a terrible role model for children," said Thomasson, whose organization opposed the bill. "The reality is Harvey Milk is a hero to so many people and a great role model," said Geoff Kors, executive director of Equality California, the group that backed the bill introduced by Leno. "It's very appropriate that the state he worked in and passed the first gay rights bill in the country should honor him." He said the bill marks the first time any state has officially honored an openly gay person. Leno said that claims that the bill would lead to schools holding gay-pride parades and similar activities were "hyperbole." The bill "mandates nothing," he said, although it "affords an educational opportunity." President Obama posthumously honored Milk with a Presidential Medal of Freedom this year, and Sean Penn portrayed him in the 2008 film "Milk," for which he received an Oscar for best actor.